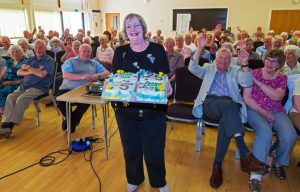 WOKING Area University of the Third Age (WAU3A) celebrated its 25th Anniversary at its monthly meeting this week. Linda Lopez-Calvete, membership secretary, decorated the celebratory cake which was cut by David Smith, chairman of the organisation from 1998 to 2003. The inaugural meeting in January 1993 was chaired by Margot Clegg, who was then chairman of Guildford U3A, and in the presence of the Mayor of Woking, Cllr Leslie Prescodd.